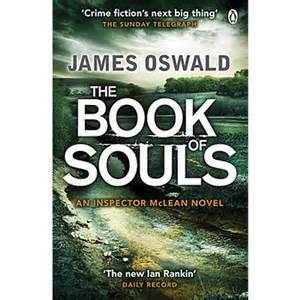 Having finished reading Natural Causes by James Oswald a few weeks ago, I dived straight in to the follow-up The Book of Souls with eager relish. I haven’t done this with an author for a very long time, preferring to move from one writer to another and come back to those I like at a later date but with James Oswald I felt the need to read one after the other in the series of three (so far, with a fourth on the way) crime novels set in the beautiful City of Edinburgh with a supernatural twist featuring his hero Detective Inspector Tony McLean. As with the first in the series, D.I. McLean is hunting a serial killer, in this case a copycat who seems to be mirroring the killer of his fiancée, known as the Christmas Killer, a decade earlier. The question is, is the man who was arrested for ten murders actually guilty of his crimes? Have they sent the wrong man down? And what is the Book of Souls that the Christmas Killer claims told him to kill? What follows is a race of time as the body count mounts far quicker than the police can handle and on top of this there are strange arson attacks throughout the city. McLean has pressure mounting from all sides as his investigations seem to go nowhere fast but he is like a wolf on the scent of its prey and refuses to give in to anything that tries to throw him off course. He has visions of a kind he can’t quite explain and also keeps seeing the man known as the Christmas Killer around the city which is impossible for he is dead, killed by another prisoner recently. Is he losing his mind or is someone or something playing games with him? As with the first book, this is a taut and thoughful crime thriller with an added supernatural element to make things interesting. Does it need the supernatural part of it? For me yes as I love anything that goes bump in the night or day for that matter, but if this series does get the green light for a television series I can well imagine they may remove that side of things or just allude to it slightly. Whether it would ruin the stories or not I don’t know but I’m jumping ahead of myself here. I just love the stories so far and the characters are strong and believable although as much as I like McLean, I wouldn’t want to be in his company too long for they keep coming unstuck in unfortunate circumstances. I love Edinburgh very much and recognized some of the places mentioned although none of the pubs I have visited yet! You don’t seem to have to read them in order but I advise it just to understand McLean better and his mental state. I can’t recommend these books highly enough and at the rate they are coming out it won’t be long before there are a whole series of them on my bookshelves along with the 1500-2000 other books I have. This short story is at the back of the book starting at page 425 and finishing at 439, running for six short punchy chapters. It starts with a death, a murder, and each chapter follows D.I. McLean and his team as they try to find out who is killing criminals, an art collector and a solicitor. Without giving too much away, what follows is short sharp chapters linking all the victims to another intriguing character. I simply loved it as I have all three stories so far. I am about to start Book 3 in the series, The Hangman’s Song that I’ll no doubt devour in a week or so. I hope D.I Inspector McLean is around for a long time to come. You can also check out James’s publishing own website here or through most online shops. Please try to support your local bookshop if you can and if you’re lucky enough to have any in your area.